#4 Michigan State v Michigan, 2015 - "Fumbled punt, recovery, touchdown"
Michigan State Spartans defeat in-state rival University of Michigan 27-23, when Michigan punter Blake O’Neil, fumbled a snap with 10 seconds remaining allowing Michigan State defensive back Jalen Watts-Jackson, to recover the fumble and return it for a touchdown. 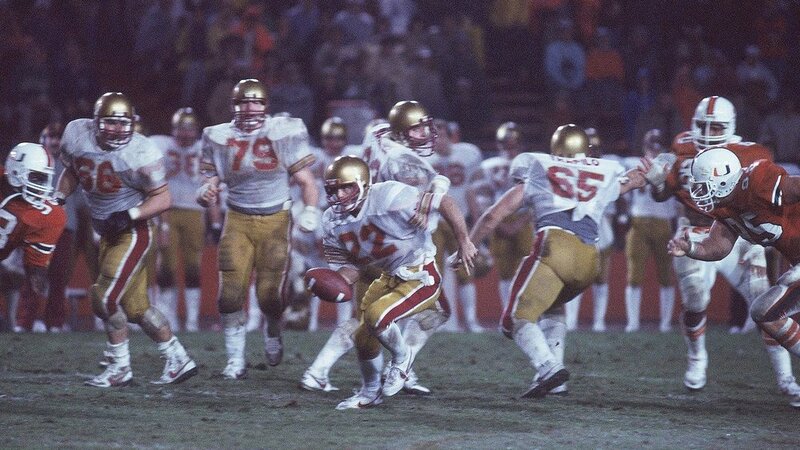 #3 Boston College v. Miami, 1984 "Hail Flutie"
#2 Alabama v Auburn, 2013 - "Kick Six"
Auburn University Tigers defeat their in-state rival University of Alabama Crimson Tide 34-28 in the 78th annual Iron Bowl after No. 1-ranked Alabama missed a 57-yard field goal (to break the tie). Auburn's Chris Davis caught the missed field goal in the back of the end zone and sprinted 109 yards up the left sideline to victory. #1 Cal vs. Stanford, 1982 "The Play to Beat the Band"
University of California Berkeley Golden Bears defeat the Stanford Cardinal 25-20 after Cal successfully completed 5 laterals and avoiding the Stanford band who prematurely flooded the field.